If you need the extra peace of mind that your iPad 2 is protected from drops and bumps, then the Otterbox Reflex Series case is a great choice. 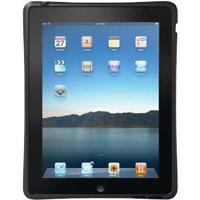 Constructed of tough polycarbonate and TPE rubber, it encases the iPad 2 around the back and sides. You can still press the buttons through the rubber cover and feel them clicking. If you need to attach some large accessory, the bottom half of the case slides off easily. While it’s made of a strong rubbery material, the case itself is not too heavy or bulky. It feels nice to hold and has a nice grip. We liked that the screen shield doubles as a versatile stand for watching media and typing. The case is available for $45.33.